As an AP/crunchy mom, I'm a pretty big fan of co-sleeping. I'm sure most of the readers of this blog are too. But let's be real for a minute- I'd also guess that most of us aren't too keen on the thought of having our kids in bed with us for the next 5-10+ years, especially if there are many of them. But at the same time, most crunchy moms aren't comfortable with the idea of crying it out, and lets be honest- uncomfortable transitions aren't exactly the funnest part of parenting, especially when they involve losing sleep. So what's a crunchy momma or daddy to do? I've found a solution that's worked really well for our family, so well that I can't believe that I don't hear more people talking about it! It's a super easy, transition free way to help your kids slowly start sleeping in their own beds as they get older. When my babies were brand new, I felt most comfortable with them right in bed with me the entire time. I'm pretty paranoid about leaving newborns to sleep(or do anything, really) alone for any length of time, so I'd always keep them close to me and bring them to bed with me as soon as I was ready to go to sleep, even if they were still sleeping. Here's the key though. At 3, 4, 6 months- whenever you start to feel more comfortable with your baby sleeping unattended for a little while- have them start out the night in their own bed. That's it! That's my whole tip! Isn't that easy? Seriously though, have them start out the night in their own bed. Then, the first time they wake up to nurse, just bring them back in bed with you, and you can co-sleep and nurse to your mutual hearts' content for the rest of the night. This is a great idea for so many reasons. The first is that it gets the child used to their own bed. Of course, as an AP momma I never expected my babies to sleep all night in their own beds(and I still don't). But I think the idea of getting them used to another bed at an early age, in a non-scary, non-threatening way can only be a good thing. If they've only ever slept in one bed for the first several years of their life, that could be a big transition when it's time, but if they're comfortable in a couple of beds from 6 months on, it makes for an easier transition. Also, since I was bringing them back to your bed to co-sleep and nurse for the rest of the night, I found that my babies didn't get scared when they woke up in the middle of the night. I came to them, every time, and they learned that when they woke up momma was going to be right there and get them for nurses and snuggles. I was NOT wiling to try to get them back to sleep in the other room, and get in and out of my bed several times a night, but I could handle getting up once and falling right back to sleep. I enjoyed the snuggles too, of course. Here's the real kicker though. Typically(and your baby might be different, of course), as babies turn into toddlers and then preschoolers, they start to sleep for longer stretches without waking. If they start out the night in their room, that means that as they start to sleep for longer stretches, they'll be sleeping longer in their room. When I first started doing this with Tristan, he'd sleep until maybe 11PM or midnight. As he started getting older, he'd sleep until around 1AM, then until about 2 or 3 AM. Now? Most nights, he sleeps the entire night in his own bed, in his own room, and comes into my bed to nurse around 6 or even 7 AM. It's wonderful! There was no transition period. There were no sleepless nights of putting him back in his bed multiple times. There was no nervousness for him about a new bed or about sleeping without mommy. He simply went to sleep in his bed like he'd been doing since he was about 6 months, except now he sleeps all night! He's totally confident in the fact that if he needs me I'll be there, and that he's welcome in my bed if he needs to snuggle, and occasionally he does need those middle of the night snuggles. But most nights, he doesn't need to anymore. My 2.5 year old, attachment parented, still nursing, never-left-to-cry-it-out toddler sleeps most nights in his own room, of his own will. Did I mention that there was NO transition period, at all??? For the life of me, I can't figure out why more moms are not talking about this! I realize every baby is different, but this was SO easy for us and worked SO well that I can't imagine it not working well for at least some other families! Now, if you want to take this tip to the next level, here's my other suggestion. Skip the crib. Really. I moved both of my babies into a twin bed by the time they were 13 months old, but if I ever have another, I'm planning to skip the crib altogether and just have them sleep on a twin or double mattress put right on the floor. Why? Like a lot of breastfeeding moms, I like to nurse my babies to sleep. And like just about any mom can testify to, it's SOOO difficult to nurse/rock/cuddle your baby to sleep, and then do the dreaded transfer to the crib. Just typing that makes me feel anxious! Not. Fun. Once I moved my babies up to a twin bed though, bedtime got so. much. easier. I could just lay next to them and nurse them to sleep, and then as soon as they were asleep I could just unlatch them, if necessary, and get up. No transfer required. They had no idea I was even gone. Absolute brilliance! Whenever they woke up in the middle of the night, there was no freaking out(most of the time, it happened occasionally). They were in a familiar, comfortable place, and they knew as soon as they called for me I'd be there to bring them into my bed. Tristan when we first moved him out of the crib. We didn't have a twin bed at first, so we just put his crib mattress on the floor. It was uncomfortable, but did allow me to kindof lay next to him and nurse him to sleep. Wasn't he cute?! Are you catching how awesome this idea is? Laying next to your baby to nurse them to sleep, no crib transfer required, and then as they get older, no transition period required to get them to sleep in their own room!!! They just sleep all night on their own whenever they're ready! SO. EASY. Am I living under a rock? Are there moms everywhere doing this and talking about it? If you've done this or something similar, I'd love to hear about it! I understand that this idea probably won't work for everyone, but it worked so well for us that I can't believe that there aren't moms everywhere shouting this idea from the rooftops! I do this...have done since my baby was born. I love sharing my bed, and like you, I don't want to do it forever. :) I'm nervous to get rid of the crib, though! Does your baby crawl all over while you're sleeping? I mean, I don't know about you, but my floor isn't always spotless (ahem...choking hazard!). 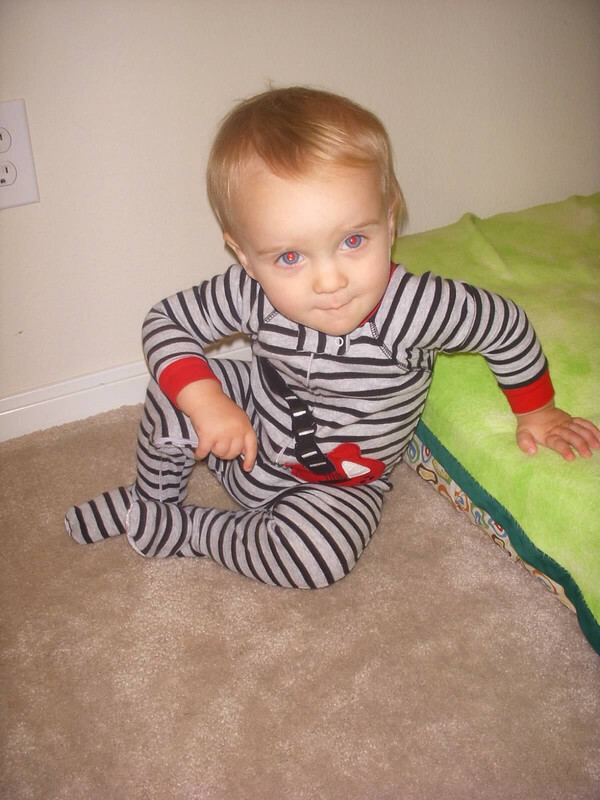 Did your baby ever get into trouble by crawling off of his mattress while you were sleeping? Totally did this with my now 8 year old. We never had issues with her sleeping in her own bed down the line. Although she would still sleep in my bed with me ( as would my 10 year old) if I let her, but that's just because we are awesome like that. We never did the "start them in their own room until the first wake up" thing, but we did skip the crib and go straight to a mattress on the floor. (Well, technically, I guess we did use a crib . . . with the front removed and pushed up to the bed as a sidecar.) As soon as crawling, pulling up became an issue, they moved to a bed on the floor right next to my side of the bed. My son is two and on a twin mattress on the floor of our room. (And he has been since about 9-10 months.) I can easily move down there to nurse/comfort him at night and I barely have to wake up. We let the girls' transfer to their own room coincide with a move; new house, new room, new beds. The two year old will likely be in our room for at least another year. But, he'll have been sleeping in his own twin bed for most of his life by then.